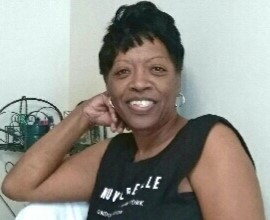 Obituary for Shawn Marie (White) Bridges | Hairston Funeral Home, Inc.
Mrs. Shawn W. Bridges, age 59 of Salisbury, passed, August 9, 2018 at her residence. She was born, July 3, 1959 in Hopkinsville, Kentucky to the late Charlie Eugene and Loretta Anderson White. She was a graduate of Trigg County High School in Cadiz, Kentucky. At the time of her death, she was employed at Bill's Truck Stop as a Cook. In addition to her parent's, she was preceded in death by a sister, Pamela Wimpye. She leaves cherished memories to her husband; Melton Bridges, Salisbury, son; DeMarlo "Martez" (Tasha) White, Salisbury; two grandchildren, one great-grandchild; brothers; Shannon (Carol) White, Canton, OH; Denny (Debra) Lewis; St. Louis, MO; sisters; Marcia (Stanley) Jordan, Lafayette, KY; Valerie (Jay)Cavanaugh, Cadiz, KY; Stephanie (Leon) Barrino, Canton, OH; Charlene (Bobby) White, Hopkinsville, KY; uncle, James White, Hopkinsville, KY; five life-long friends, Toni Tyler, and Bernetta (Doddie) Watkins, both of Hopkinsvlle, KY; Brenda Kendall, Winston-Salem Lynda Kendall, Salisbury, Donna Kendall, Statesville; a host of nieces, nephews, cousins and close friends. Service: Friday, August 17, 2018. Visitation: 10:30 a.m. Funeral: 11:00 a.m. Jerusalem Baptist Church, 1570 N. Long St., Spencer, NC 28159. Rev. Dr. David L. Bracken, pastor. Rev. Timothy Bridges, eulogist/officiant. Burial will follow at 1:00 p.m. at the US National Cemetery, 501 Statesville Blvd., Salisbury.